One of the special pleasures of studying William Blake’s prints is the way new treasures keep turning up. *↤ EDITORS’ NOTE: COPY h OF THE SONGS OF INNOCENCE AND OF EXPERIENCE HAS RECENTLY RE-EMERGED. FOR MORE INFORMATION SEE THE NEWS SECTION OF THIS ISSUE. The following is a brief report on several of his illuminated books and single leaves therefrom that have come to light in recent months, supplemented by a discussion of some previously recorded impressions with unusual characteristics deserving more attention than they have received in the past. On 13 January 1830, Sotheby’s in London offered at auction a small volume listed in the catalogue as lot 41 and described as “Blake’s Phantasies, Songs of Innocence and of Experience, on 55 PLATES, brown calf, elegant, very rare.” According to an annotated copy of the catalogue in the British Museum Print Room, the vendor was Robert Balmanno (1780-1865), the great Stothard collector who apparently also owned copy U of Songs of Innocence and other works by Blake. Lot 41 was sold to “Glynn” for the munificent sum of one pound. Nothing further was known of this volume to either Keynes and Wolf in 1953 or Bentley in 1977, in whose bibliographies it is listed as untraced copy BB of Songs of Innocence and of Experience.1↤ 1 Geoffrey Keynes and Edwin Wolf 2nd, William Blake’s Illuminated Books: A Census (New York: Grolier Club, 1953), p. 66; G. E. Bentley, Jr., Blake Books (Oxford: Clarendon Press, 1977), p. 425. All plate number and copy designations in this essay follow Blake Books. See also Bentley, “A Supplement to Blake Books,” Blake: An Illustrated Quarterly, 11 (Winter 1977-78), 138-44. After an absence of 150 years, the book reappeared to public view in the spring of 1980 and was offered at auction once again at Sotheby’s, this time in their Hodgson’s Rooms on Chancery Lane, on 1 May 1980, as lot 100. According to a pencil note on the title-page, the volume was “Bought of Blake May 1816,” probably by Balmanno or someone acting for him. The auction catalogue further indicates that, after Glynn’s purchase in 1830, the book passed to John Wild, whose initials are written “over the small partly erased library stamp in the lower margin of the general title, and who inserted his bookplate.” Wild’s library passed to his cousin and the book remained in the cousin’s family until its sale from “The Property of a Lady” on 1 May. The volume fetched £16,000 from Andrew Edmunds, the London printdealer, who sold it shortly after the auction to the Oxfordshire bookdealer Colin Franklin. He sold it by August 1980 to the New York bookdealer Justin G. Schiller, in whose private collection the volume now resides. I have not seen this copy of Songs of Innocence and of Experience,2↤ 2 Mr. Schiller tells me, in a letter of 7 July 1980, that exclusive rights to inspect and describe the volume have been granted to one individual (not me) until August 1982. There is, however, a brief report, without reproductions from copy BB, by Sir Geoffrey Keynes in The Book Collector, 30 (Spring 1980), 39-42. Sir Geoffrey records the following sequence for the plates: 1-4, 6-7, 11, 25, 18, 19, 15, 16-17, 22-23, 20-21, 9-10, 12, 8, 27, 24, 5, 13, 14, 26, 54, 28-33, b, 38, 46, 51, 45, 47, 41, 39, 52, 43, 53, 37, 50, 42, 44, 49, 34-36, 40, 48. The plate offsets correspond to this sequence. but its extraordinary importance deserves preliminary notice in this journal. The information presented here is based on the auction catalogue and descriptions of the book supplied by Donald Heald, who inspected the book for me prior to the auction, and Andrew Edmunds. There can be no doubt that the volume now owned by Mr. Schiller is copy BB. It is bound in early nineteenth-century brown calf, the spine elaborately decorated in gilt tooling and stamped “Blake’s Phantasies.” These features explain the description of the binding and odd title given the book in the 1830 auction catalogue. At the inner margin of the general title-page are fragments of blue paper—probably remnants of the original wrapper in which Blake or Mrs. Blake bound the book. The 55 plates (the usual 54 plus pl. b, “A Divine Image”) on 55 leaves are printed in black ink with the delicacy and maculated textures typical of Blake’s inking. The leaves (wove paper, apparently without watermark) measure about 18.3 × 11.8 cm. Many plates contain thinly inked areas that have been carefully painted over in black, perhaps diluted India ink. This hand work suggests that the begin page 5 | ↑ back to top book was not simply left uncolored but was specifically prepared for sale as a copy in black. Three plates, however, have some hand coloring (see illus. 1). Unlike the black tinting in thinly printed relief areas, the light washes in etched whites on these plates are not applied with much skill and may have been added by someone other than Blake. The plates are numbered consecutively in gray ink just above the upper right corner. The form of these numbers is very similar to those in copy T of Songs of Innocence and of Experience; they were in all probability written by Blake. 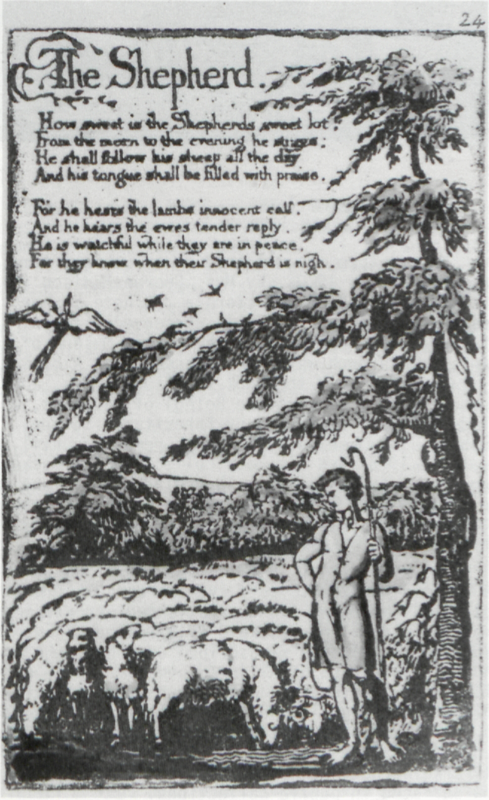 1 “The Shepherd” from Songs of Innocence and of Experience copy BB. Relief etching, 11.1 × 6.9 cm., partly hand tinted. Photograph courtesy of Sotheby Parke Bernet & Co.; reproduced with their permission. 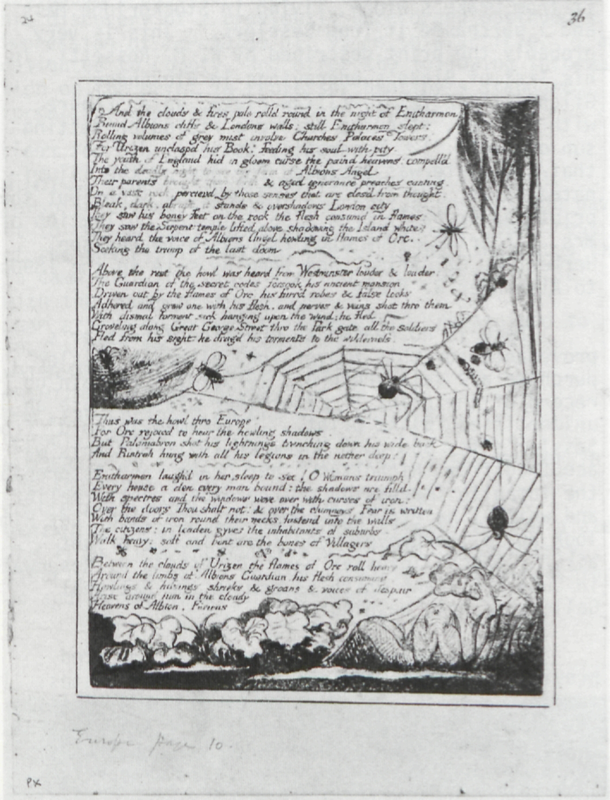 makes copy BB the most complete copy known of Songs of Innocence and of Experience printed by Blake, lacking only the early, rejected tailpiece but including complete texts of all the poems of the anthology. It certainly deserves more thorough bibliographic and chalcographic study than the cursory description given here. 2 “A Divine Image” from Songs of Innocence and of Experience copy BB. Relief etching, 11.2 × 7 cm., partly hand tinted in black. Photograph courtesy of Sotheby Parke Bernet & Co.; reproduced with their permission. 3 Europe, copy c, pl. 4. Relief and white-line etching, second (proof) state, 23.6 × 17.1 cm. Achenbach Foundation for Graphic Arts, San Francisco. 4 Europe, copy c, pl. 9. Relief and white-line etching, third (published) state, 23.7 × 17.1 cm. Achenbach Foundation for Graphic Arts, San Francisco. This volume was acquired at an unknown time, probably in the 1920s, by Mrs. George Madison (Alice) Millard of Pasadena, California. A note by her describing the book is still preserved with it. Mrs. Millard, the proprietor of the Little Museum of La Miniatura through which also passed copy N of Songs of Innocence, sold the book for $100 to Mrs. John Hudson Poole (nee Caroline Boing) of Pasadena, who died in 1931. It passed by inheritance to her husband, in whose house the book remained until his death in 1955 when his book collection was packed and stored by his heirs. They placed the Blake collection5↤ 5 The collection included standard items, such as reference works, a copy of Blair’s Grave (1808), and a set of the Job engravings, but nothing else of importance. for sale with the San Francisco bookdealer Bernard Rosenthal, who sold the posthumous copy of the Songs to Mr. Vershbow late in 1979.6↤ 6 I previously noted this sale, and incorrectly described the volume as containing 43 plates, in “Blake in the Marketplace 1978-1979,” Blake: An Illustrated Quarterly, 14 (1980), 7. In the mid-nineteenth ce * ry, George A. Smith collected and bound together a large, miscellaneous group of plates from Blake’s illuminated books, some separate plates, the manuscript “Order” of the Songs, and the manuscript of Allan Cunningham’s Life of Blake. The contents and complex history of this collection are spelled out in Bentley, Blake Books, pp. 337-41. Three plates from this group, untraced since their sale from George C. Smith’s collection at Parke Bernet, New York, on 2 November 1938, have now surfaced in public collections. 5 Europe, copy c, pl. 15. Relief etching, partly color printed, 23.4 × 17.2 cm. Houghton Library, Harvard University. Lot 30 in the 1938 auction, containing five plates from Europe copy c, was sold to the dealer Gannon for $140. Blake Books, p. 341, records that three of these are now at New York University and that the remaining two, pls. 4 and 9, are untraced. These plates, printed on the recto and verso of a single sheet, were acquired by T. E. Hanley, whose widow, Tullah Hanley, gave them in recent years to the Achenbach Foundation for Graphic Arts, M. H. de Young Memorial Museum, San Francisco. 6 Milton, pl. 13. 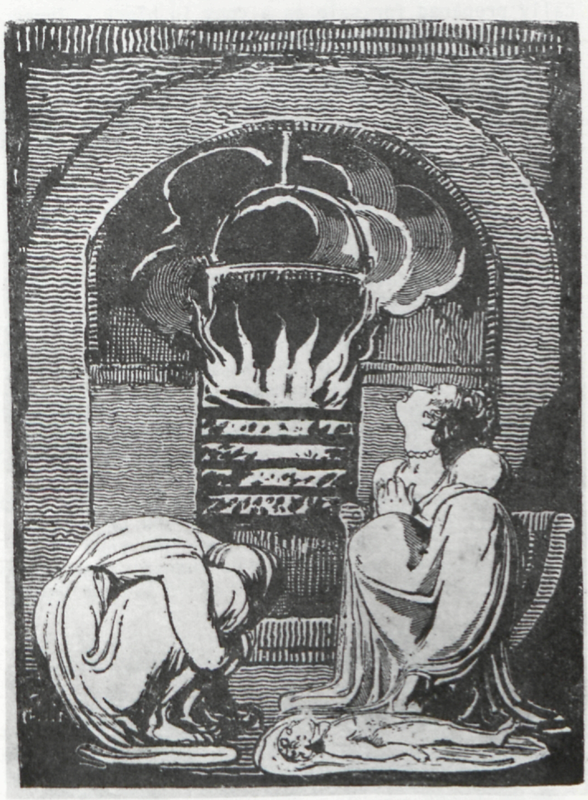 White-line etching, 15.9 × 11.1 cm., second state, printed in three colors. Philadelphia Museum of Art. over his chest, but before the addition of further white lines on the traveller’s pack, its straps, his right upper arm and shoulder, and his upper stomach. The only recorded impressions of the first state are in proof copy b (Pierpont Morgan Library) and in the collection of Leonard Baskin; the only other second state impressions are in proof copies a (British Museum) and b.8↤ 8 I take this information from Bentley, Blake Books, p. 143, except that Bentley does not note that pl. 4 in copy a is in the second state. The impression of pl. 9 (illus. 4) on the verso is in the last of three states. 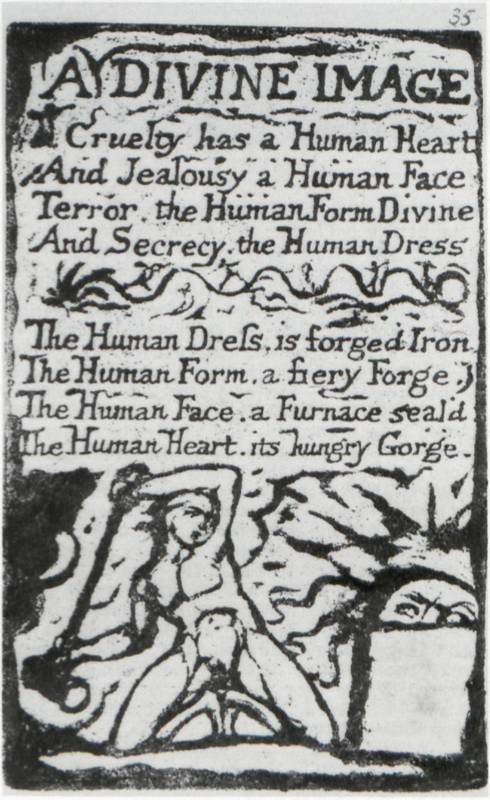 There are slight pencil marks below the image on the right; a partly erased brown ink begin page 8 | ↑ back to top inscription below the design reads “Famine [followed by an illegible word] to eat the child for food.” This title is based on George Cumberland’s inscription on the same plate in copy D of Europe (British Museum). An impression of Europe pl. 15 was also included in George A. Smith’s bound collection. This was sold with four other prints from Europe in lot 32 in the 1938 George C. Smith auction ($160 to E. Weyhe Inc.) and is listed as untraced in Bentley, Blake Books, p. 341. The print was acquired by Mr. and Mrs. Philip Hofer, probably directly from Weyhe, and given by Mrs. Frances Hofer in 1979 to the Houghton Library, Harvard University, Cambridge, Massachusetts (illus. 5). The unwatermarked wove sheet, 31.3 × 22.6 cm., bears stab holes along the left margin, “36” in ink top right (George A. Smith’s original foliation), “24” in pencil top left (Macgeorge foliation? ), “PX” in pencil bottom left (a bookdealer’s coded price? ), and “Europe page 10.” in pencil below the left corner of the image. A pen and ink framing line extends along all four sides of the plate mark; a second frame in the same ink is 4 mm. from the image. The basic printing color is brown, but the text (except for a few words in lines 5 through 9) has been gone over with a pen in black ink. Much of the design is poorly printed and the spider webs, insects, leaves at the bottom, and outlines of the figure lower right have also been worked over in black ink. The dark areas at the bottom are color printed in green—rather patchy on the right, but thick and heavy in the lower left corner. The impression appears to be an experimental pull, perhaps rejected because of the poor inking and color printing. However, Blake (or someone else?) spent a good deal of time with pen & ink trying to salvage the print. 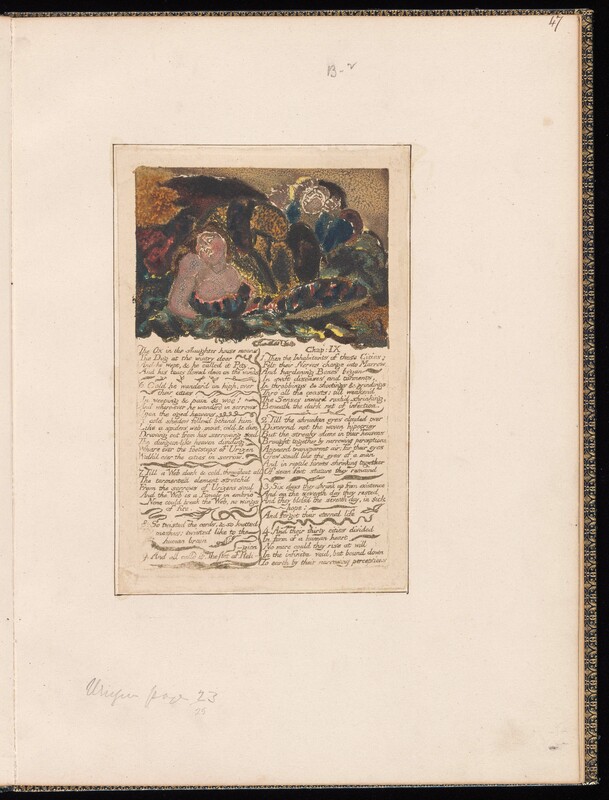 If this work was indeed done by Blake, perhaps he intended to hand color the design further and transform it into an impression of sufficient quality to use in a copy of Europe. Mrs. Hofer has also given the Houghton Library a copy of Little Tom the Sailor. It is printed in dull black ink on a wove sheet 49.9 × 17 cm., cut close on the right with the loss of a fraction of the image. The dark areas in the designs may have been hand tinted with India ink. This example, at one time in the Graham Robertson collection, is included as no. 5 in Keynes’ list of copies.9↤ 9 Keynes, Blake Studies, 2nd ed. rev. (Oxford: Clarendon Press, 1971), p. 108. While there are a good many unbound and now widely scattered proofs of the Europe plates, separate impressions from Milton are extremely rare: Bentley, Blake Books, p. 305, records only a single impression of pl. 38 in the collection of Mrs. Ramsey Harvey. I recently came upon an unrecorded impression of Milton, pl. 13 (illus. 6), at the Philadelphia Museum of Art, which received the print as a gift from Carl Zigrosser in 1975. 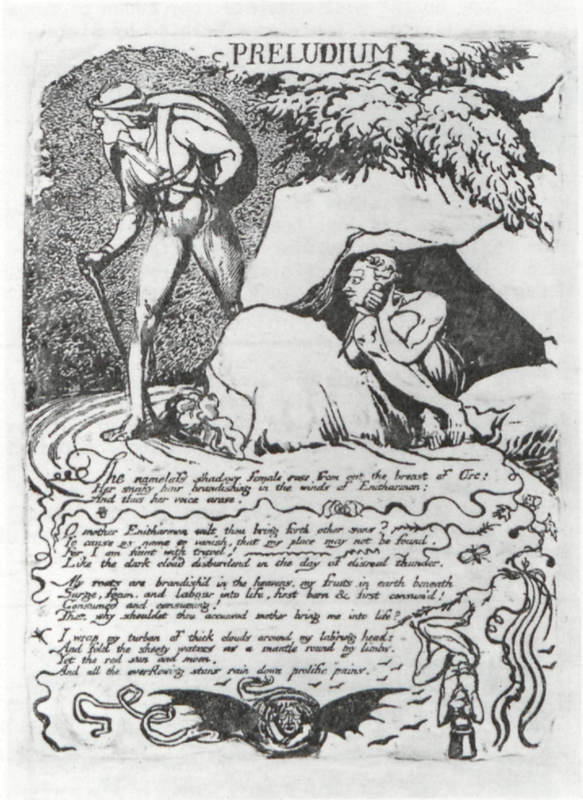 On the back of the unwatermarked wove sheet, 21.2 × 15.4 cm., Zigrosser has written the following: “Milton Descending etching by William Blake trial proof printed in two colors [sic; see below] #358 Binyon’s Engraved Designs of W. Blake [followed by a reference to Blake’s Milton and quotation of lines 13, 21-23 from pl. 12] This print was purchased by Alexander W Drake, former art editor of The Century, from Gilchrists [sic] in the 1890’s. Sessler purchased it from Drake’s widow, living in Stockbridge Mass and I purchased it from Sesslers.” This is very probably the print described by W. M. Rossetti, in his list of Blake’s engravings in Alexander Gilchrist’s Life of William Blake, as a “Figure, with a glory, standing before a rising or setting sun or globe.”10↤ 10 Gilchrist, Life of Blake (London and Cambridge: Macmillan, 1863), II, 258. The description is repeated in the 1880 ed., II, 280. Apparently Rossetti did not realize that the plate was executed for one of the illuminated books. He does not indicate as much, but the print was probably then (1863) in the collection of Mrs. Gilchrist, from whom it passed to her son, Herbert H. Gilchrist, and then by sale in the 1890s to Alexander W. Drake. There is no reason to question Zigrosser’s provenance for this impression, although Sessler’s purchase and sales records, 1919-1975, contain no record of the print.11↤ 11 Sessler’s records of (most?) Blake materials that have passed through the Philadelphia shop have been assembled and copied for me by Michael Young of the University of Pennsylvania. Zigrosser did purchase an unidentified “Blake print . . . framed in gold” from Sessler’s for $60 on 3 November 1951; but this was acquired from “Nicholson,” not Drake, and is probably the intaglio impression of the experimental relief and white-line etching, sometimes entitled “Let Him look up in the Heavens and laugh in the bright air,”12↤ 12 See Keynes, Engravings by William Blake: The Separate Plates (Dublin: Emery Walker, 1956), pp. 38-39 and pl. 24. which Zigrosser gave to Lessing J. Rosenwald in June 1961, and which is now in the National Gallery of Art, Washington. I do not believe that it has been noticed previously that this plate exists in two states. In comparison to the impressions in copies A, B (illus. 7), and C of Milton, the Philadelphia example shows fewer relief plateaus between white-line cross-hatchings just below the figure’s left breast, apparently the result of more tool work in this area. The clearest difference, however, and one that can not be explained simply as inking and printing variations, is the boldly scratched white lines below and to the left of the man’s right foot, clearly visible in the Philadelphia impression but not in copies A, B, and C.13↤ 13 For a reproduction of the plate in copy A, see David V. Erdman, The Illuminated Blake (Garden City, New York: Anchor, 1974), p. 232. For copy C, see Kathleen Raine, Blake and Tradition (Princeton: Princeton Univ. Press, 1968), II, 249, fig. 184. This same second state with additional white-line work also appears in copy D of the illuminated book (illus. 8). Thus, the second state was executed rather late in the production of Milton, sometime between c. 1808 when copies A-C were printed and 1815 (or later) when copy D was printed.14↤ 14 Copies A-C are on Whatman paper watermarked 1808; copy D is watermarked RUSE & TURNERS | 1815. See the discussion of printing history in Bentley, Blake Books, p. 309. The figure and his immediate surroundings are lightly printed in reddish-brown. The dark areas above (see illus. 6) are heavily inked and printed in blue-green; the dark ground below the figure is in black. There is a small spot of olive green—perhaps simply a thin droplet of the blue-green in the sky—on the man’s torso just above his left hip. The thickly printed colors show the dendritic reticulations of Blake’s color printing, c. 1794-1796. I suspect, however, that these are not opaque gum- or glue-based pigments, but thick ink, perhaps partly dried even before its uneven application to the plate. 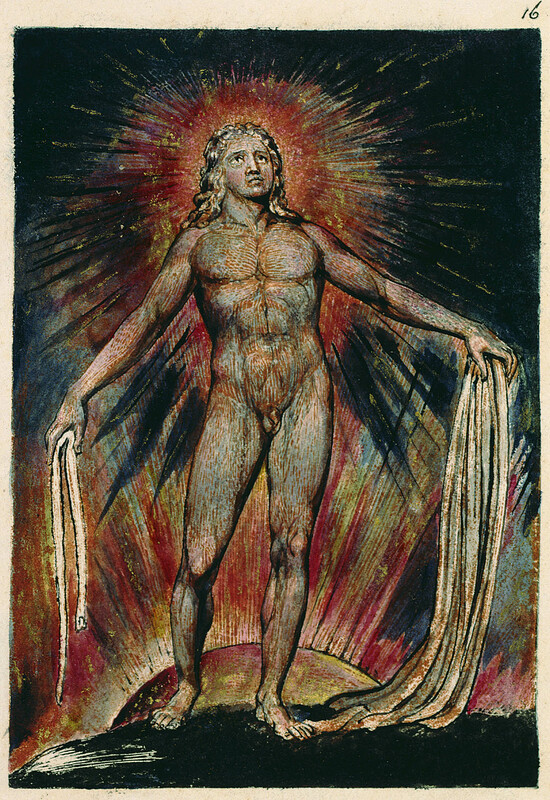 Yet it is surprising to find that Blake continued to experiment, well into the nineteenth century, with opaque coloring techniques and reticulated textures so characteristic of his work of the mid-1790s. Professor G. E. Bentley, Jr., was another recent visitor to the Philadelphia Museum of Art. That rich begin page 9 | ↑ back to top collection has yielded further treasures to a most assiduous prospector, and he has asked me to record his discovery of a previously unrecorded posthumous impression of Jerusalem pl. 99 in this article. I am delighted to comply, and offer the following information on the print in Professor Bentley’s standard format for supplementing Blake Books. BINDING: Loose; inventory number: 19 75-26-21. Verso inscribed (probably by Carl Zigrosser, who gave it to the Museum) “McGeorge [sic] Coll.” The rest of the inscription is not useful. This indicates that it came with the miscellaneous group of prints &c. with the Order of the Songs. LEAF SIZE: 15.7 × 23.0 (irregular), remargined to 16.2 × 23.1 cm. WATERMARK: 1830 (cut off above). ONE LEAF, printed on one side only. NUMBER: “99” (or “91”?) scratched on the copper in the top right corner. VARIANTS: There are horizontal streaks on the plate. The lines from the substratum of design show very clearly, especially in the irrelevant cross-hatching on and at the level of the heads. In the summer 1980 issue of this journal (see note 6), I listed the sale of three plates from Songs of Innocence and of Experience (“The Ecchoing Green,” second plate, “The Little Black Boy,” second plate, and “Holy Thursday” from Experience), for many years in the collection of Dr. Bent E. Juel-Jensen, to Colin Franklin and then to Zeitlin & Ver Brugge, the Los Angeles book and print dealer. These were returned to Colin Franklin, who has now sold them to Raymond M. Wapner of Roosevelt Island, New York.15↤ 15 Mr. Wapner is a partner of the New York bookdealer Justin G. Schiller, with whose permission I record the ownership of these plates. 7 Milton, copy B, pl. 13. White-line etching, 16 × 11.1 cm., first state, hand colored. Huntington Library, San Marino, California. 8 Milton, copy D, pl. 13 (16 in this copy). White-line etching, 16 × 11.1 cm., second state, hand colored. Lessing J. Rosenwald Collection, The Library of Congress. 9 The First Book of Urizen, copy H, pl. 1. Relief etching, 14.9 × 10.3 cm., on wove sheet 18.9 × 13.9 cm., mounted. Text ink printed in golden brown; design color printed in red, brown, gray, green, black, and blue. Beinecke Library, Yale University. 10 The First Book of Urizen, copy H, pl. 4. Relief etching, 13.6 × 10.1 cm., on wove sheet 17.5 × 12.5 cm., mounted. Text ink printed in green; design color printed in brown and green. Figure hand tinted with pink. Beinecke Library, Yale University. 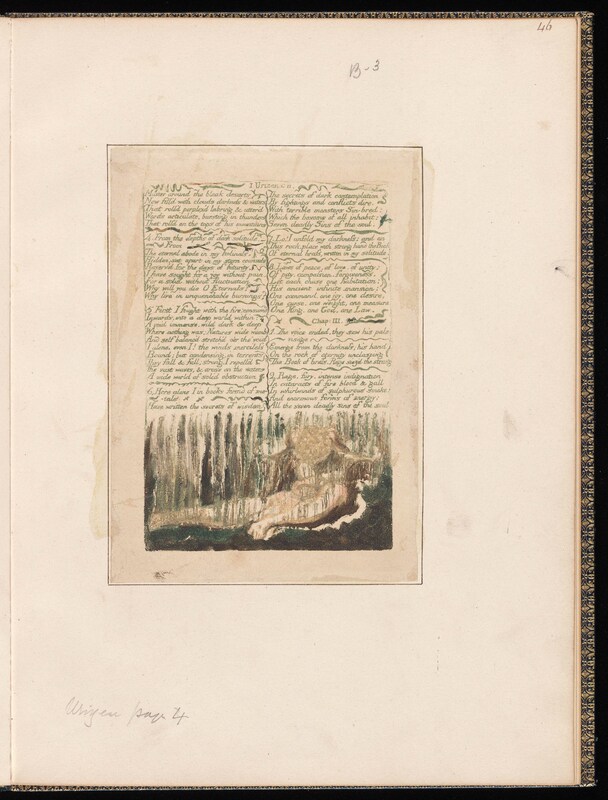 11 The First Book of Urizen, copy H, pl. 25. Relief etching, 14.8 × 10.4 cm., on wove sheet 18 × 11.6 cm., mounted. Text ink printed in olive green; design color printed in gray, rose, rust red, blue, and several shades of brown. Perhaps some hand tinting in yellow. Beinecke Library, Yale University. begin page 11 | ↑ back to top of Blake’s best nineteenth-century relief printing of plates intended for hand coloring. 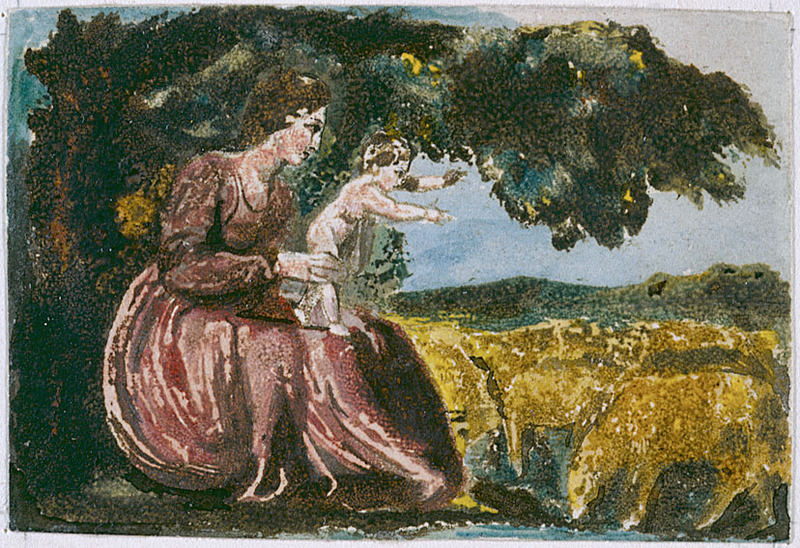 The cadmium orange ink is similar to the ink in copies U (on paper watermarked 1815), Z, and AA (both printed c. 1825) of Songs of Innocence and of Experience. The coloring of the text area in the second plate of “The Little Black Boy” and the ink framing lines (blue, rather than the usual red) are typical of late copies of the Songs. The India paper also bespeaks a late date of printing. None of Blake’s original graphics on laid India were unquestionably printed until the 1820s. 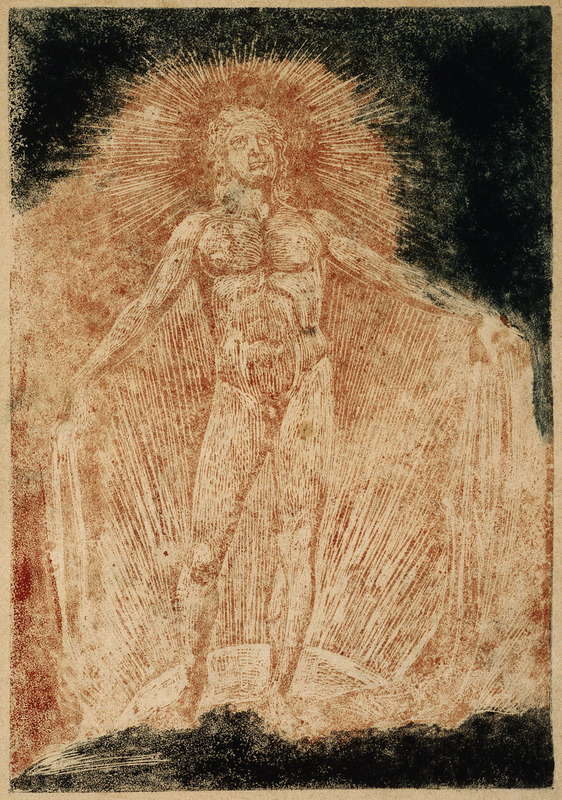 As I have suggested elsewhere,16↤ 16 See my William Blake, Printmaker (Princeton: Princeton Univ. Press, 1980), p. 220. Linnell’s preference for laid India may perhaps be explained by the need for a paper smooth and hard enough to take an accurate impression of the dense patterns of fine lines and flick work on his engraved portraits. Linnell’s influence may have prompted the use of such paper, for he favored laid India even for unfinished proofs. The inking and printing of the plates clearly point to Blake’s hand, but I am much less certain about the incomplete hand coloring. The washes on all three impressions are thin, even, and applied to fairly broad areas with some disregard for printed outlines. These features can be found in Blake’s hand coloring of the early 1790s, but by the nineteenth century he had developed a far more sophisticated style with greater delicacy and precision in the application of colors. The best examples show fine brush work, similar to the technique of miniature painting, and subtle blending at the borders between colors—yet without any violation of outlines. Christ’s gown on the second plate of “The Little Black Boy” is colored a bright scarlet found in no other impression.17↤ 17 At least according to the color notes in Bentley, Blake Books, p. 391. None of these three plates contains any of the drawing with pen and ink (or sometimes even pencil) so typical of Blake’s work. It may be unfair to compare the coloring of these plates to finished examples in complete copies of the Songs, but my doubts persist nonetheless. Proof impressions of Blake’s relief etchings with incomplete inking or coloring are rarely as beautiful as finished examples, but they can provide interesting information about his graphic processes. Even recorded impressions of this type in well-catalogued public collections deserve more careful study. Wandering through that enormous repository of information, Bentley’s Blake Books, one can all too easily overlook the special qualities of odd proofs and unfinished pulls. Although New Haven, Connecticut, is more famous for theoretical speculation than chalcographic treasures, the city’s leading university offers several opportunities to study unusual impressions of plates from Blake’s illuminated books. 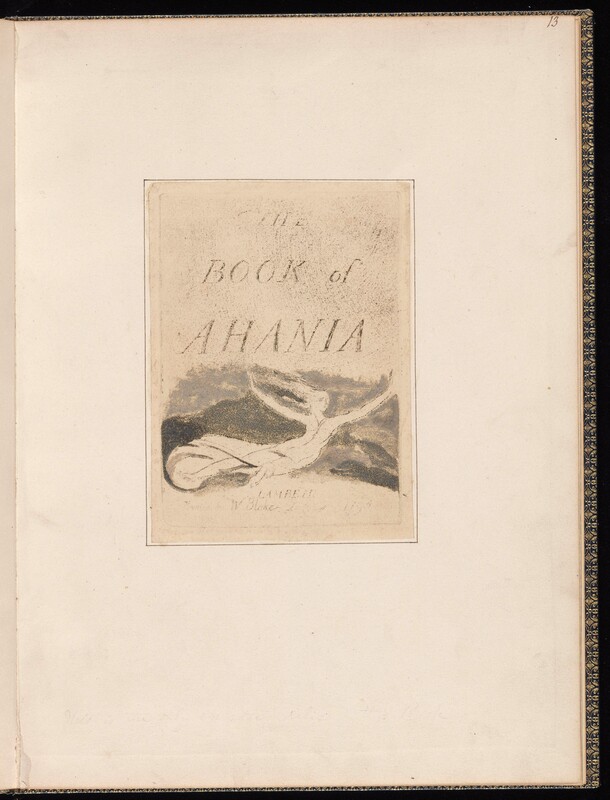 12 The Book of Ahania, copy Bb, pl. 1. Intaglio etching, 13.6 × 9.8 cm. on wove sheet 14.4 × 10.6 cm. Color printed from the surface (of the intaglio plate?) in gray and dark green. Beinecke Library, Yale University. 13 The Book of Ahania, copy Bb, pl. 1. Intaglio etching, 13.6 × 9.8 cm. on wove sheet 29.7 × 21.7 cm. Color printed from the surface of a plate or piece of paper in purple, green, rust red, and brown. Beinecke Library, Yale University. 14 “The Shepherd,” design only on wove paper, 7.5 × 6.4 cm. Color printed in red, blue, green, dark brown, golden brown, and flesh tones with additional hand tinting and pen and ink work. Yale Center for British Art. 15 “Spring,” design only on wove paper, 4.5 × 6.8 cm. Color printed in red, green, dark brown, golden brown, and flesh tones with additional hand tinting and pen and ink work. Blue wash in sky. Yale Center for British Art. tree on the left, he was printed so as to produce reticulated textures yet leave white areas (eyes, for example) for later development on the print. Plate 25 (illus. 11) clearly demonstrates that Blake was able to color print from etched areas (upper right, and the figure lower left) as well as relief plateaus.19↤ 19 There is a similar color printed proof of pl. 25, without hand tinting or drawing, in Sir Geoffrey Keynes’ collection. 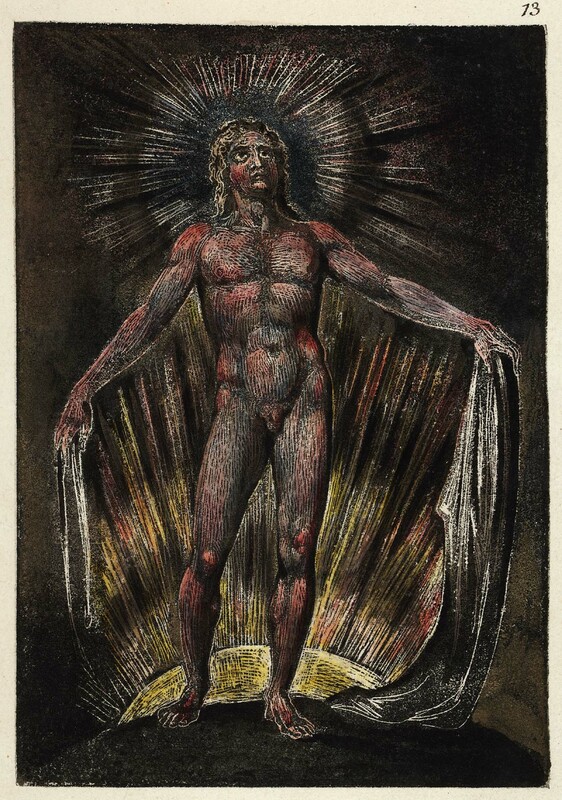 The extreme shallowness of the etching, particularly in The First Book of Urizen, combined with the thickness of Blake’s color medium, permitted this type of proto-planographic printing. The etching of the design provided little more than a guide for the hand painting of the copperplate. 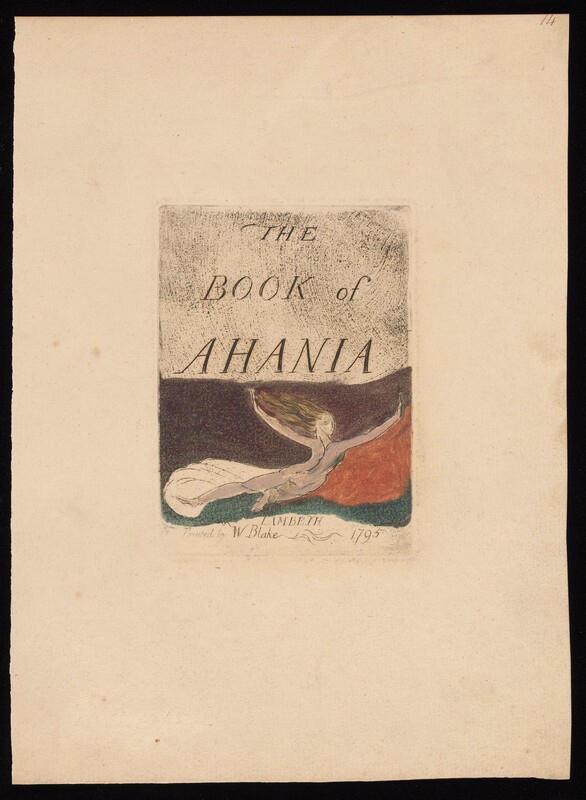 The Beinecke Library also owns two impressions of the title-page for The Book of Ahania and one of pl. 4 from the same illuminated book. The first two (illus. 12, 13) constitute a rare set of progress proofs. The two illuminated books etched in intaglio, The Book of Los and The Book of Ahania, do not lend themselves to color printing from the surface of the copperplates. The pressure necessary for good intaglio printing is far too great for color printing from surfaces. 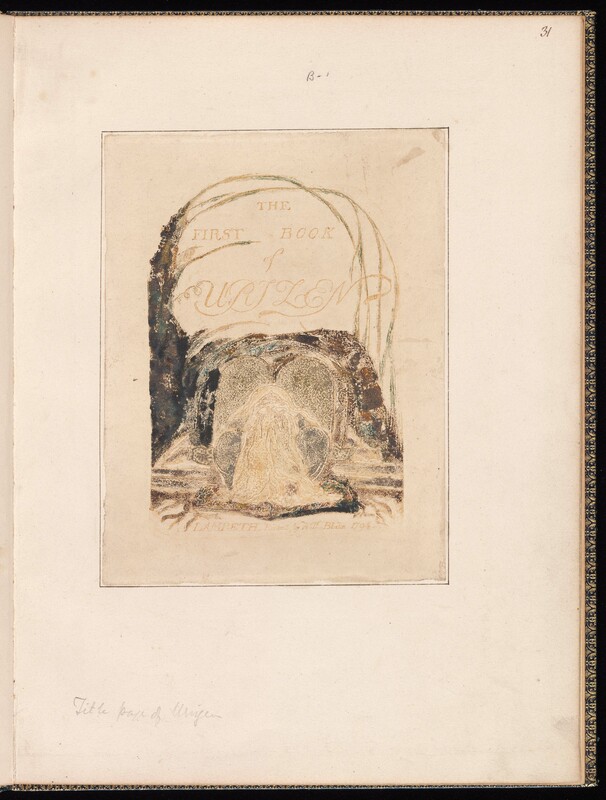 The title-page to The Book of Los (copy A, British Museum) shows that the design must have been color printed or blotted with a separate plate or piece of paper rather than the copperplate bearing the etched text.20↤ 20 See Essick, William Blake, Printmaker, p. 130 and fig. 118. The exceptionally light printing of the text in the first Beinecke proof (illus. 12) suggests that Blake may have been trying, at least in this one case, to print simultaneously from the intaglio lines and the surface of the plate in two colors. The results are not promising. The second proof (illus. 13) is much better as an intaglio impression and the four-color printing of the design area is more even with fewer streaks and uncovered spots. It seems unlikely that work of this quality could have been produced in one run through the press. Thus these two proofs may record Blake’s progress from single to double printing for his intaglio, color printed books—a progress that led to a technical division between printing texts and printing designs with important consequences. In this same period during the mid-1790s, Blake’s color printing began to develop independent of his work as a poet, most successfully in the great 1795 color printed drawings, and finally evolved into the so-called “tempera” paintings of 1799-1800. In “Blake in the Marketplace, 1976-77,”21↤ 21 Blake: An Illustrated Quarterly, 12 (1978), 31. I recorded the sale at auction of impressions of the designs without text of “The Shepherd” and “Spring” from Songs of Innocence. These two prints (illus. 14, 15) were acquired in 1978 by the Yale Center for British Art, New Haven. They are not incomplete or working proofs, but highly finished color prints of great beauty. They are two of only three known color printed designs from Songs of Innocence: in copies of Songs of Innocence and of Experience containing color printing, such work is confined to the Experience plates alone. The Yale Center prints are cut close to the designs, and thus it is possible that the plates were originally printed with the texts and cut apart by someone other than Blake. I suspect, however, that both were printed as designs only with the texts masked. If so, then these prints are similar to Blake’s work in the “Large” and “Small” Books of Design. 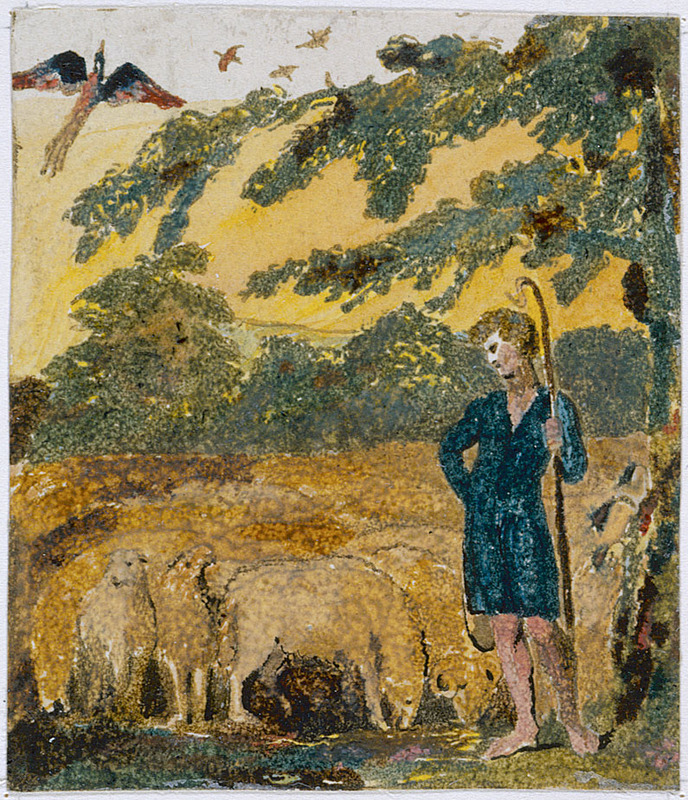 “The Shepherd” and “Spring” now at the Yale Center may have been produced for the conjectural copy B of the Small Book of Designs or begin page 13 | ↑ back to top some similar collection of color printed miniatures.22↤ 22 See G. E. Bentley, Jr., “Dr. James Curry as a Patron of Blake,” Notes and Queries, 27 (1980), 71-73, for new information on a possible purchaser of Blake’s color prints besides Ozias Humphry. Like the other prints described here, they testify to Blake’s life-long commitment to innovation in the graphic arts. But far more than the others, these two small prints demonstrate the excellence of his best work.